In Post 1489 we saw how to interact with a contour plot using mouse clicks. That is helpful, but limited to a small number of click types, e.g. left or right clicks, double clicks, etc... And it is not entirely intuitive which one to use if you don't know in advance. Today we examine how to make key presses while the mouse is over the graph do something useful. 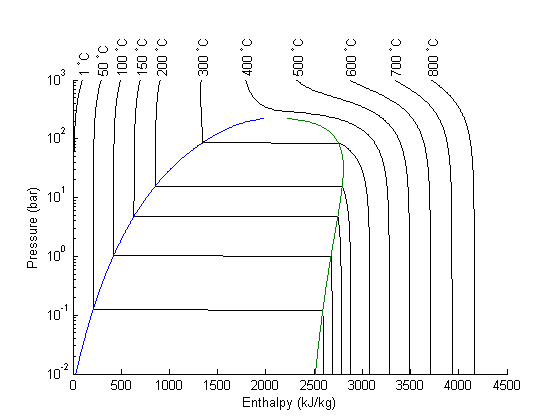 We will examine an enthalpy-pressure diagram for steam, and setup functions so you can press u, s, p, h, or t to display the relevant thermodynamic property under the mouse cursor. The XSteam module makes it pretty easy to generate figures of the steam tables. 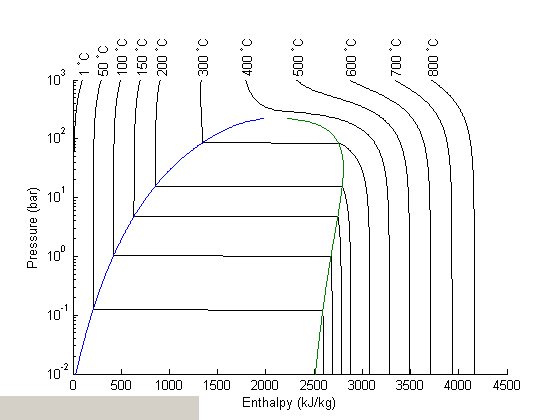 Here we make the enthalpy-pressure graph. % adjust axes position so the temperature labels aren't cutoff. Now we add a textbox to the graph where we will eventually print the thermodynamic properties. We also put a tooltip on the box, which will provide some help if you hold your mouse over it long enough. we need to define two callback functions that will get called when the mouse moves over the figure, and when a key is pressed. % We get the point under the cursor. % now define a string for each type of key press. % want to quit, in case q was accidentally pressed. finally, attach the callback functions to the current figure.